Auburn, AL – The fourth ranked Auburn Tigers improved to 5-0 with a 51-23 blowout victory over the Jeff Davis Volunteers (0-4, 0-2) Friday night at Duck Samford Stadium. After being sacked for a safety on the games opening drive, Griffin Speaks capped a 74 yard drive on the Tigers second possession with a touchdown pass from just inside the Volunteer 20 to Josh Norris. Runningback Jay Walker extended the Auburn lead to 14-2 later in the opening quarter, bolting into the endzone from six yards out. Walker accounted for another pair of scores before the break. Walker’s first half burst plus a pair of pick-six interceptions by Cally Chizik and Amaury Hutchinson, a one yard TD run by Walker and a 11 yard scoring grab by Lecorious Williams plus a safety, forced by Zaire Oliver gave the Tigers a commanding lead heading into the locker room. After the half, Jeff Davis’ offensive came to life as Karon Phillips connected with Reggie Summage for a score from inside the Auburn 10. Later in the contest Ernest George hauled in a Curtis Wilson touchdown pass from 12 yards out and Wilson called his own number scampering into the endzone from the one. Auburn quarterback Griffin Speaks accounted for 178 yards on the night while connecting on 12 of 17 passes. Jay Walker lead the Tigers on the ground with 68 yards on nine carries and three scores. 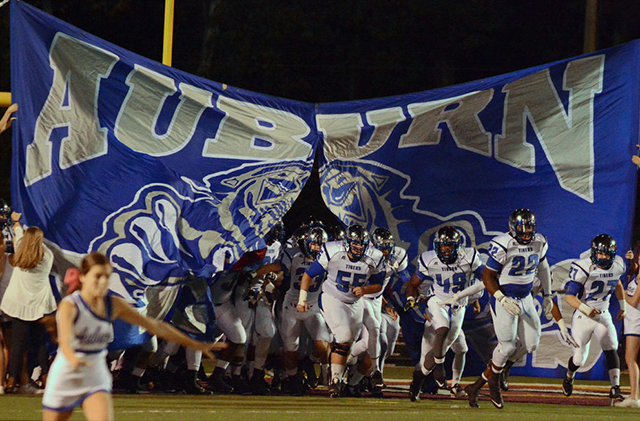 Auburn returns to action Friday night, welcoming 6A Minor (2-3, 2-1) to Duck Samford Stadium. Jeff Davis clashes with cross-town rival Sidney Lanier (2-2, 2-0) at Cramton Bowl.